As a reminder, the following are the important points of ajapa. 7. Practice of khechari mudra2. If you can carry out all these features then you will make great progress. In stage 1 of ajapajapa you synchronized So with the incoming breath and Ham with the outgoing breath1. In stage 2 the process is very similar, but each breath will start with exhalation with the mantra Ham and end with inhalation with the mantra So. The mantra Ham is still associated with exhalation and So with inhalation (as in stage 1) but now the mantra will be Hamso instead of Soham. There should be no pause between Ham and So but a slight pause after one round of Hamso. This may seem a fine difference compared to stage 1, but it is nevertheless important. Relaxation of the mind and body is essential before starting the practice. To achieve this you can do a series of asanas and pranayama and/or you can chantAum a number of times. Adopt any suitable method. As a means to become aware of the contents of your subconscious mind, you should periodically stop ajapa and do chidakasha dharana for a short duration. The method of stage 2 is as follows: Take a comfortable sitting position. Perform the same preliminary relaxation procedures as described for stage l3. Chant Aum a number of times, say 13 times. Then do khechari mudra and ujjayi prana-yama2. Become aware of the breathing process for a short time making it deeper and slower. Try to feel as though you are the process of breathing itself. Then imagine the breath moving between the navel and throat. Inhalation upwards from navel to the throat. Exhalation downwards from the throat to the navel. Be attentive to the rhythmic flow of breath. Don't force; just be attentive to the natural process of breathing. Watch the breathing become slower and slower. If you find it difficult to imagine the up and down flow of breath, you can imagine that there is a glass tube connecting your navel to the throat. As you breathe out the level of water drops from the throat to the navel. Continue this practice for at least 5 minutes. Then synchronize the mantra Hamso with the breathing. With exhalation downwards from the throat to the navel hear the sound Ham. With inhalation upwards from the nave l to the throat, hear the sound So. Thus with each round of respiration you will hear Hamso Hamso Hamso and so forth. There will be continuation between exhalation and inhalation, but a slight break between inhalation and exhalation. Be sure to maintain awareness of the breath and the mantra. After some time, say 5 minutes, leave ajapa and become aware of the space in front of the closed eyes. Watch any images that arise with an attitude of detachment; these are the contents of the subconscious mind. Continue this for a few minutes. Then return to the practice of ajapa with mantra and breath awareness. After about 5 minutes, again observe the space in front of the closed eyes. After a short time return to ajapa. Continue in this manner for as long as you have time available. 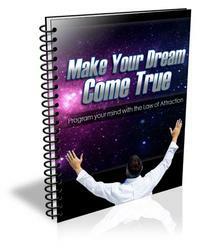 Control Your Own Life and Achieve Your Dreams With The Law Of Attraction. Ever imagined how amazing it would be to achieve success like other people? Ever though to yourself, How come they find success so easily?